SINGAPORE - The first phase of a project to transform Ang Mo Kio into a model cycling and walking town was officially completed on Saturday (July 9), and launched by Prime Minister Lee Hsien Loong. 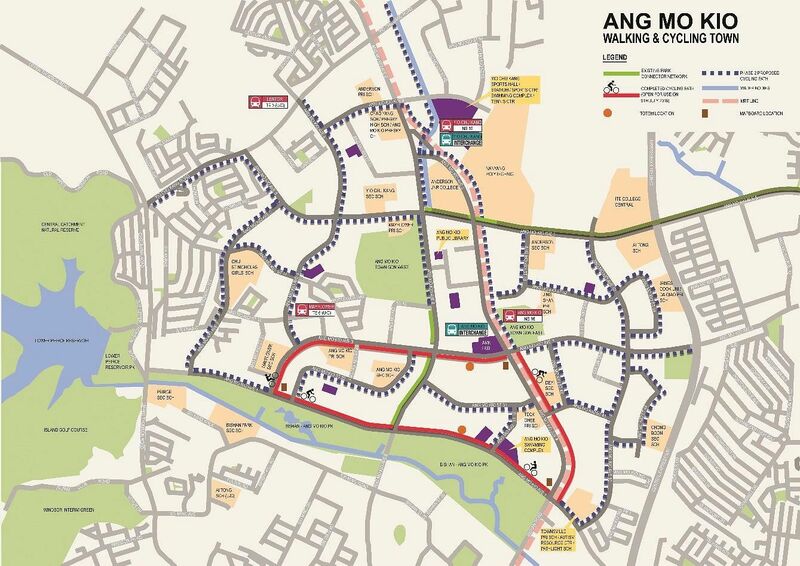 With it, residents now enjoy a 4km cycling route that loops around Ang Mo Kio Avenue 1, 3, and 8, offering them a seamless connection to amenities such as the Ang Mo Kio MRT station, a swimming complex and the AMK Hub. 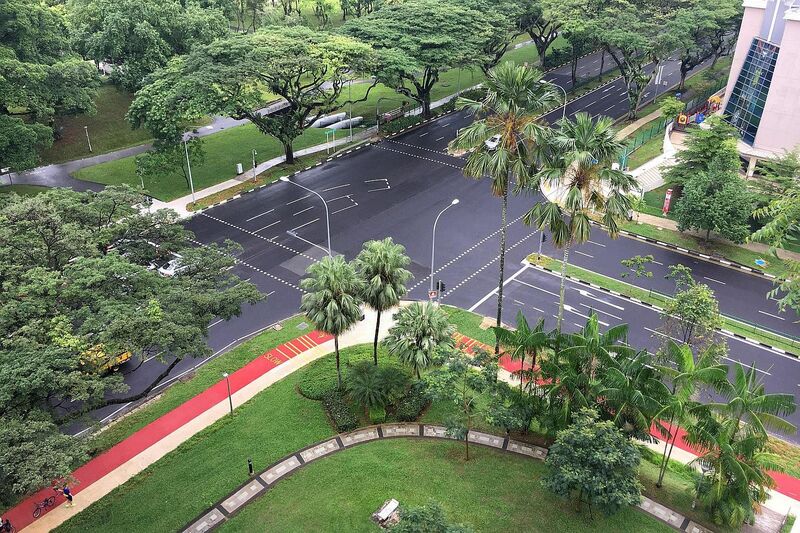 Ang Mo Kio, designated in 2014 as a test-bed for concepts to promote "car-lite" living, is the first among residential towns to have dedicated cycling lanes painted in red, to make them more distinct from footpaths. Mr Lee, who tried out the cycle paths on Saturday, said that through the changes, cycling and walking can be made more convenient for residents, and will lessen the pressure on them to own and drive cars. The project to transform Ang Mo Kio is jointly designed and developed by the Land Transport Authority (LTA) and the Urban Redevelopment Authority (URA). The first phase saw the first time planners removed a slip road - located at the junction of Ang Mo Kio Ave 1 and 3 - to create more space for cyclists and pedestrians, in an effort to boost safety. Other features include rumble strips to get cyclists to slow down at road crossings, as well as road markings to get motorists to watch out for these more vulnerable road users. A key feature of the project is a 2.6km walking and cycling corridor that will link Yio Chu Kang MRT station to the Bishan-Ang Mo Kio Park, making use of space under the MRT viaduct. The first kilometre of this corridor - from the park to Ang Mo Kio MRT station - has been completed, with the remaining 1.6km to be built in the second phase, targeted to be completed in 2019. In the second phase, whose construction will start soon, another 16km of cycling paths will also be added, making Ang Mo Kio the town with the longest cycling network. Plans are also in place to narrow the road along Ang Mo Kio Street 44, to provide more space for pedestrians and cyclists. The LTA and URA also intend to build an elevated walking and cycling path running alongside the MRT viaduct beside Ang Mo Kio station, to offer better connectivity. Residents in Ang Mo Kio welcomed the new amenities. Ms Amy Ong, a retiree in her 50s, who cycles from her home in Serangoon Gardens to Ang Mo Kio Central every weekend, said the cycling paths are a significant improvement. Before they were built, she would still cycle under the viaduct along Ang Mo Kio Avenue 8, but the ride was less smooth. "There were many potholes and at some stretches we had to carry our bicycles and use the stairs. These have been replaced with slopes with a gentle gradient. It's also better lit at night,"said Ms Ong. Ms Sandy Siew, 45, a fitness instructor, said having the cycling path go under the MRT viaduct is a good idea, as it offers shelter from the rain and sun. As the paths are painted red, they are more distinct from the walking paths, so pedestrians do not stray into the lanes, she said. "When we cycled on the pavements, we had to watch out for pedestrians. We still have to be careful on the cycling lane, but it's a more comfortable ride," Ms Siew said.